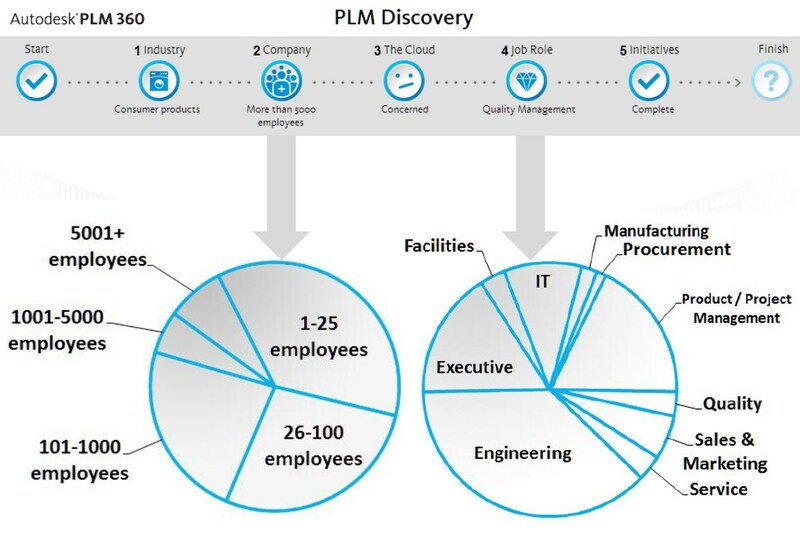 Yesterday Autodesk issued a press release titled “Survey of Autodesk PLM 360 Customers Shows Benefits of Cloud” which shed some light on how Autodesk’s PLM offering was being adopted. Today I spent some time with Richard Blatcher, Senior Industry Marketing Manager for PLM/PDM at Autodesk and tried to understand a little more about this survey. According to the survey more than 350 companies are actively using and evaluating Autodesk PLM 360 in a production environment. This amounts to more than 8,000 users using more than 40,000 workspaces and managing more than 2.2 million items. Autodesk PLM 360 was announced last year at AU and has been out there since February of this year. Here are some of these customers and prospects that took part in the survey. This slide gives a breakdown of the kind of people using Autodesk PLM 360. As expected more than half the customers and prospects who took part in the survey were using something like Excel to manage their PLM related needs. 28% were using nothing at all and 11% were using a competitive product. I asked Richard whether Autodesk was ready to announce a big win from the 11%. He replied that Autodesk had a few large enterprise deals but wasn’t allowed to talk about them. He mentioned a deal related to a hi-tech electronics company that went down just last week. I asked Richard whether Autodesk was seeing an interest in PLM 360 from small businesses only. He replied that the interest was across the board. He said, “People irrespective of company size are questioning the business value of traditional PLM. There is true enthusiasm for Cloud PLM“. Which begged the question, “What about the enthusiasm about the Cloud itself?” Richard admitted that there were a few people who were concerned with the cloud. But was quick to point out a statistic in the survey which showed that the number one reason for people switching to or trying out Autodesk PLM 360 was because data was immediately accessible anywhere in the world. Besides the customer survey Autodesk has recently launched an initiative called “Discover Autodesk PLM 360” in which people are asked to answer a few questions to see how PLM can improve their business. They receive a report and an opportunity to attend a PLM Discovery Workshop online or in person. So far more than 1,200 people have answered these questions and here are some numbers. It is quite clear that people who could never afford a big iron PLM system are looking at Autodesk to provide them a solution that will work for them. It will be interesting to see how this plays out.